So we can't keep politics out of local government because it IS local government and that extends down to the lowliest parish council. However, I think most people would prefer to keep the ideologies of national politics out of local decision making. Background How I ended up taking a political stand. Also, what I would change, both local and national, if I had the power (I don't). 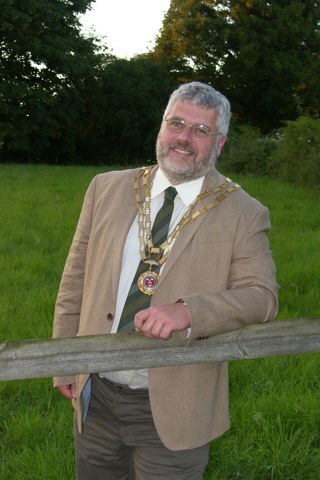 Mayor of Dereham: I have not been afraid to speak out over the years and there have been occasions of significant disagreement, although always resolved through discussion and proper democratic process. It goes some way to show how well the process works because on 20 May 2014 Councillors elected me to serve as Dereham Town Mayor. Town Councillor (Dereham): Dereham was a highly politicized council with seats hotly contested. Standing as a 'Green Party' candidate was quite a challenge, but after a couple of 'paper' attempts I was elected in May 2007. The Town Council has less political tension than previously, possibly due to the wider mix of representation. Parish Councillor (Ovington): On moving to the village, the chairman of the parish council pushed papers into my hand and said "you are standing aren't you". General Election 2010: Green Party candidate for Mid-Norfolk.